Frank Channing Haddock, M.S., Ph.D.
A total beginner should start here. We'll try to help point you in the right direction. Is there judgment in the afterlife? What are Near Death Experiences (NDEs)? If you are interested in finding out about a more detailed subject, try this selection. Is there any research that proves the validity of psychic phenomenon? Are there alternative theories of physical reality? What are some techniques for astral projection? Pick a category below and start exploring! Learn how respected authors' opinions compare on a wide variety of life after death topics. Copyright © 2012–2019, Quixotic Vision LLC. All rights reserved. Web development by White Light Concepts, LLC. the afterlife, past lives, near death experiences, reincarnation, spiritual stories and more. 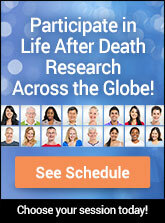 Join others from around the world and search for answers about life after death.